After sanding the bottom of the boat I painted it with the first of the upper coats. I’ll definitely do one more coat of paint, and another on the deck. The photo of the keel box slot depicts a better rendering of the true colour than the photo showing the bottom, which for some reason looks like off-white, but in fact is a pale, lemon yellow. That colour will be visible at sea from a fair distance – hence my choice. I’d rather the boat was seen by those in other vessels, particularly by watch officers of large ships, as I intend crossing the River Thames from Leigh-on-Sea to the Medway. This will involve cutting across dredged channels for incoming and outgoing shipping. 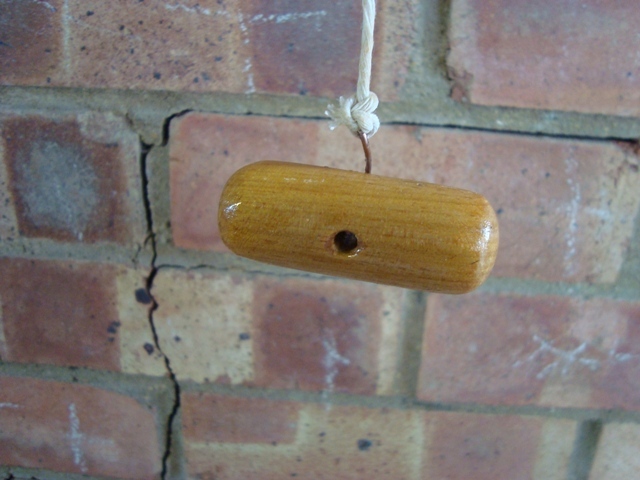 In addition to painting the boat and varnishing the keel weights, I made a toggle that will be attached to the bow with a thin piece of rope for when I want to pull the boat along when she is on her purpose-built trolley (yet to be made). 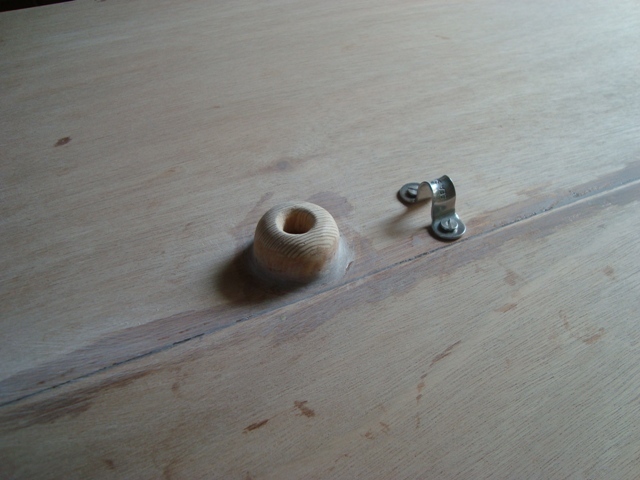 The toggle could also be part of an anchoring system, since the anchor line will be attached to it via the painter. 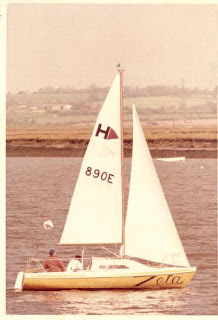 I have now decided on a name for the boat and I have ordered the appropriate stick-on vinyl lettering from Fred Walton at Ebay.co.uk. 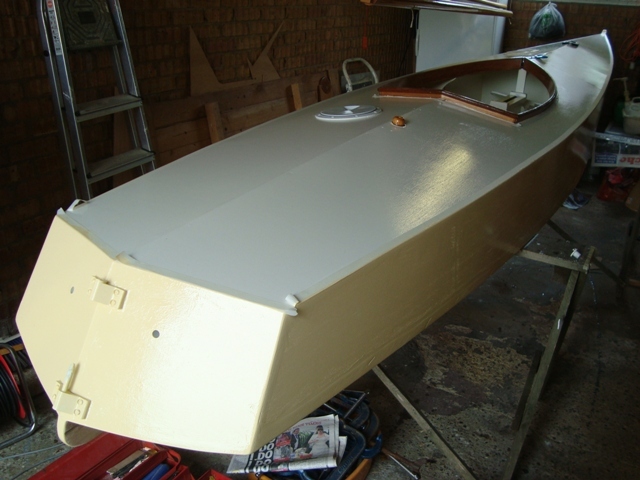 Tomorrow I may paint ’Sharpy’s’ bottom again, perhaps for the final time; that would leave me with just one coat of paint to do on the deck, after which the boat would be almost ready to use. The undercoat has been applied to the bottom of the boat. If I’m able to paint the bottom with a second coat tomorrow, only one more layer will be necessary, but I may do a fourth coating to make sure the hull is properly protected for when she comes into contact with a beach or when she grounds on an unfriendly surface. The keel weights should take quite a pit of the impact when beaching. If there’s any amount of surf, things could get awkward, because with the keel in place she will be heavy for me to haul up a beach. 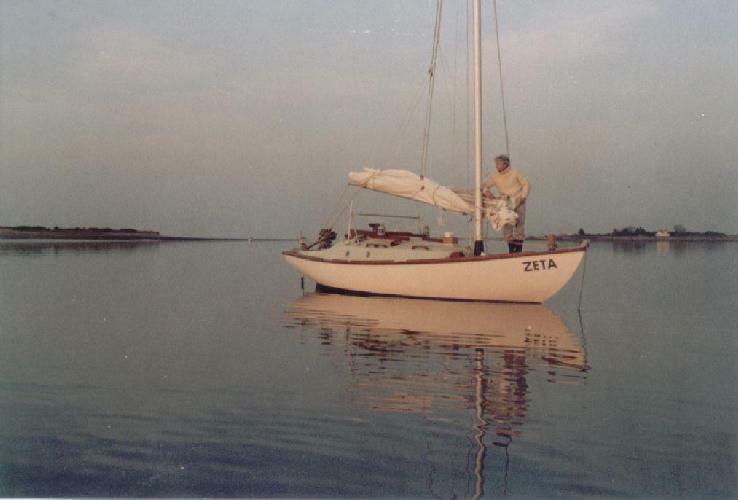 Getting her on her side to extract the keel could be problematical. From that point of view, she will not be as easy to beach and secure out of harm’s way as a lightweight canoe such as my ‘Caleb’. 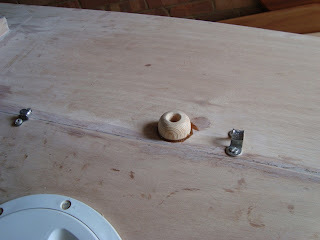 In addition to painting ‘Sharpy’s’ hull, I once again epoxied the inside of her keel box. I want to make sure water does not penetrate the surface of the plywood with in the box. To that end, I’ll apply yet another coating of epoxy. Before I try the keel in earnest I’ll spray both the inside of the keel box and the keel with silicone wax to reduce friction between them. 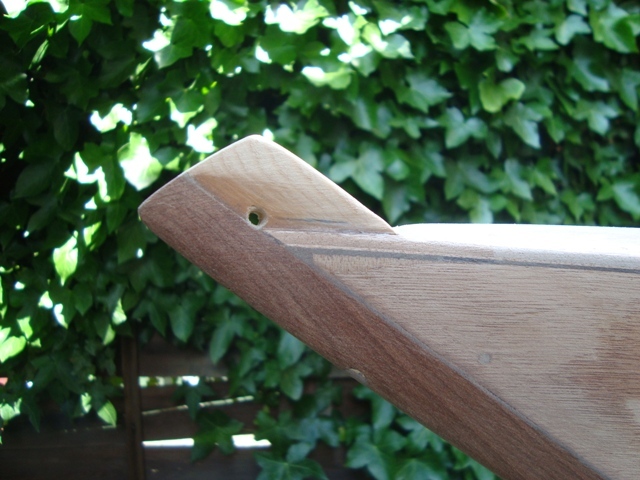 I also gave the seat another coating of varnish, and at the same time I varnished the upper and side surfaces of the keel weights and the stem post. 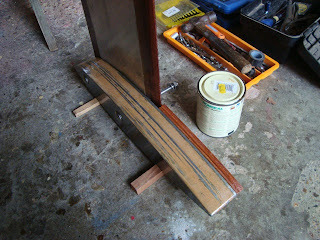 Tomorrow, I’m hoping to have time for varnishing the lower surfaces of the weights. 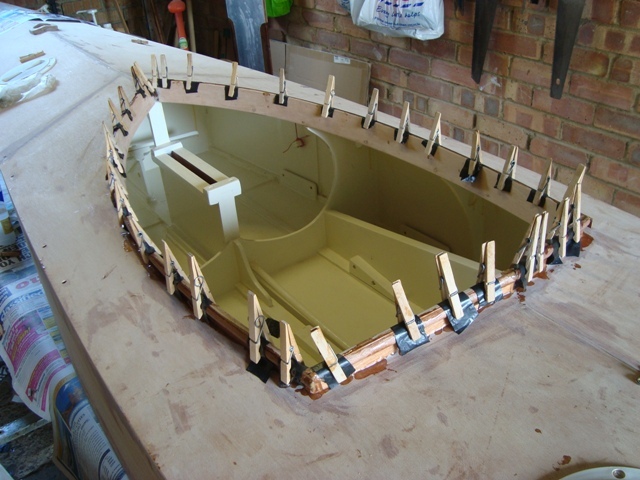 At this stage, when the boat is almost finished, I am occupied with a number of small jobs that are necessary for her completion. Setting up her rig and her steering will be like topping out a building, but I’m not into parties and celebrations when launching a new boat. I much prefer a boat’s baptism to be a quiet and private event, a time for reflection, and a moment for checking her out. If all goes well, I shall be thankful and satisfied with the fruit of my labour; I shall look forward to learning more about her when we shall share adventures together. This morning I prepared the sides for painting by smoothing them with waterproof emery paper that had been dipped in water. I have used this method when preparing paint on previous boats. There’s no dust in the process, and it produces a very smooth surface. That will probably be the last coat of paint I’ll apply to the sides. 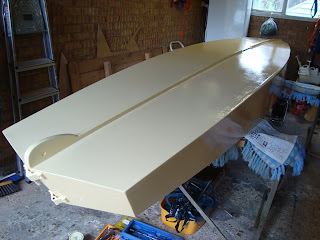 There’s another coat required for the deck, and at least three coats for the bottom, possibly four, because that’s the part of the boat most likely to come into contact with objects that may abrade the paint. I also varnished the seat, which has made it look presentable; one more coat of varnish, and it will look good. Cushions in place, and the tent on the stern deck. I doubt the tent will be satisfactory there. The spars are finished. I’ll bend on the sail to the gaff and boom, and when I get a chance I’ll try rigging the boat. She’s going to be upside down for at least three days while I apply paint to the bottom. I need another four days for doing the paintwork; afterwards she’ll be nearly finished. 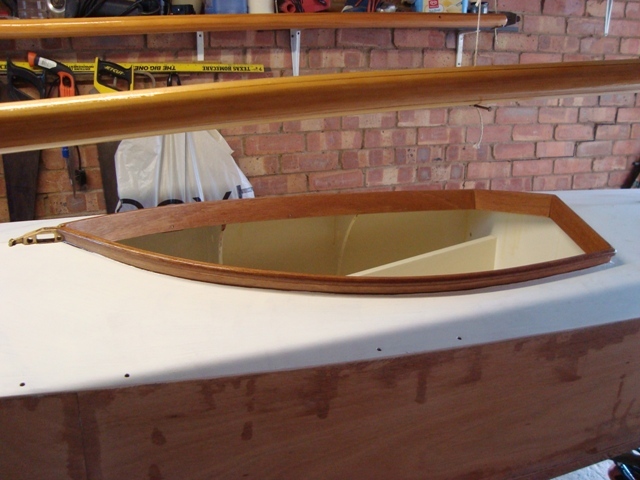 There are one or two things that need sorting out, such as the final touches to the keel, deciding on where to stow the paddle, and making a toggle handle to be attached to the stem post. I must also set up a system for anchoring the boat. 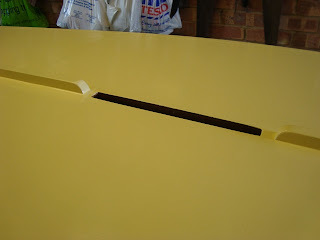 After I painted the sides and transom with a light yellow paint I varnished the seat slats and the coamings. Surprisingly, that took most of the afternoon, because I spent a fair amount of time sanding the seat and the coamings before varnishing them. The seat was recycled from a bin tip and I’m not necessarily keeping it as the final seating arrangement. My intention is to see how it goes. If the seat is relatively comfortable with the waterproof wheelchair cushion I bought for it, I shall probably keep it. Today, I gave it its first coat of varnish. By the time I’ve given it another two coatings, at least, it may look a little more attractive. I’m not overly keen on the appearance just now, as it looks decidedly second-hand, if not third! The principle of recycling is good. Let’s hope I feel that way after finishing and trying the seat. Eventually this series on building a roof rack keel boat will come to an end, to be replaced with other articles, mainly about small sailing boats. Of course, I shall report back giving details of how ‘Sharpy’ performs, along with write-ups of my adventures aboard the new boat. Meanwhile, if there’s anything of note in the building process I’ll mention it. Today was spanking hot which was ideal for painting the deck with an upper coat of light cream International Toplac paint, the same colour as the interior of the boat. Hot conditions helped me with the varnishing because the heat thinned the varnish, so that it readily and evenly flowed off the brush onto the spars and cockpit coamings. 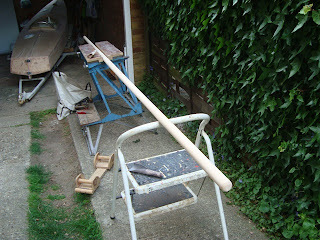 I also varnished the stem post and the rudder stock, along with the rudder. 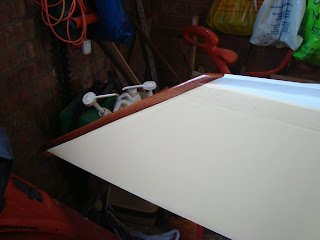 These latter items were already epoxied, but I varnished them to preserve the epoxy which is affected by direct sunlight. 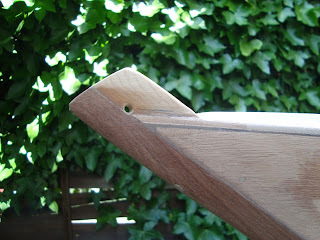 Two or three coats of varnish will be sufficient for protecting them from UV rays. 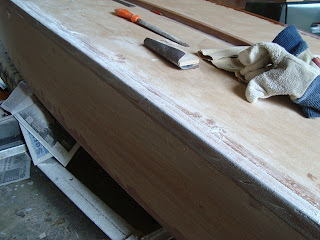 The sides of the boat are ready for their first upper coat of paint, and there is no paint on the bottom, as yet. Several days could pass before I finish painting the hull and decks, at which time I’ll be able to concentrate on bringing the road trailer up to scratch. Getting a good finish is the name of the game. 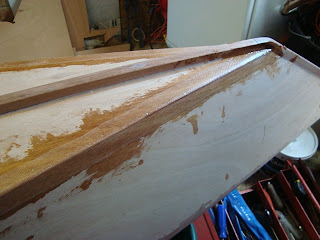 To that end I did quite a bit of fine sanding on the sides of the hull and the spars before painting and varnishing them. I don’t suppose I’ll be able to see my face reflected from the paint when the boat is finished, but as long as she’s smart, that will satisfy me. My moods oscillate between wanting to finish her quickly so that I can sail her, and wanting to take my time to make her look presentable. 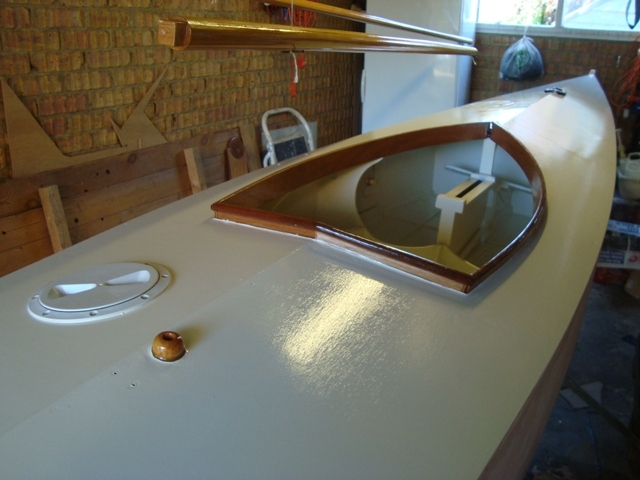 As I work towards completing her I find myself dreaming of being out on the water, testing her to see how she goes. Will she be a good all-round sailing boat, one that will respond to zephyrs, as well stand up to a good blow? 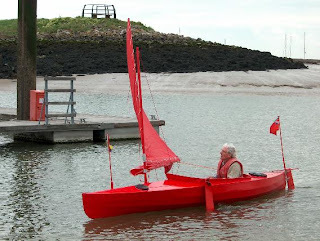 Will she be a dry boat when the water is choppy? Will I feel secure and comfortable in her? Shall I be able to reef her lateen sail easily, and shall I find launching her relatively easy? How will she sail to windward? Will she be close-winded? I wonder how well she will tack. My guess is that she will carry her way through each tack, because of the weight of the keel and her comparatively slender hull. Well, all of these things are for finding out. How long will it be before I take her for her first sail? That’s hard to know – maybe within a fortnight. It depends on many things, but that is what I would like. There’s very little to say about the continuing saga of building the boat, other than that today I gave ‘Sharpy’s’ spars a third coat of varnish, and the coamings a second one. I also painted her decks with an off-white undercoat. A friend examined the wheel bearings of the boat’s road trailer and confirmed they will have to be replaced. He could not change them because the ones he had brought to replace them with are metric, but the trailer bearings are Imperial! At least, we know what is required, and my friend can get the bits. Varnish makes the collar look darker than I thought it would. I feel I’m getting there at last. The cockpit coamings and the stem post have been given their first coating of varnish, and I’ve added a second coat to ‘Sharpy’s’ spars. Soon, I’ll start painting her hull. Ideally, I should do the bottom first, then her sides, followed by her decks, but, as I want to press on, I’ll paint her decks first, because I’ll also be able to apply more varnish to the coamings. ‘Sharpy’s’ bottom will be last. Well, that’s my plan! I wonder if things will actually work like that. Despite contrary weather with heavy showers, I was able to accomplish what I hoped to do. 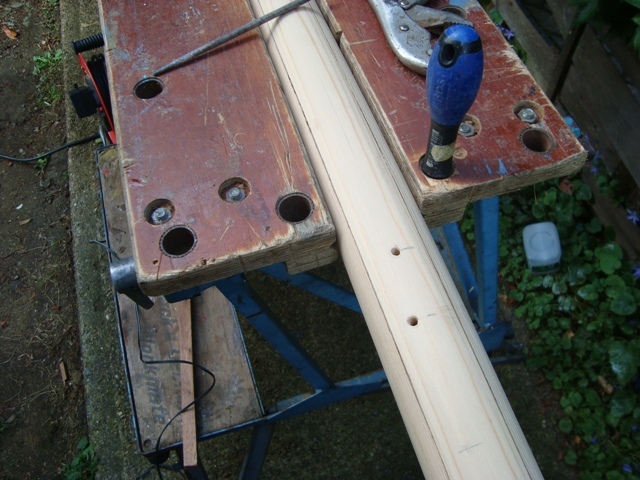 The lengths of half-round wooden beading have been epoxied to the upper edges of the coamings. 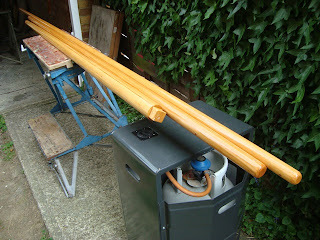 I also drilled holes in the spars for various attachments and I varnished them. 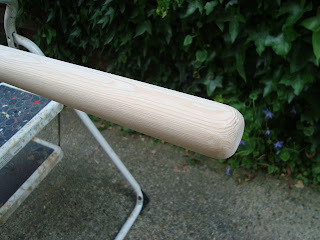 As per instructions for the first coat of varnish, I added 20 percent of White Spirit, so that the diluted varnish could be absorbed into the wood. That will provide a good firm base for subsequent coatings of undiluted varnish. 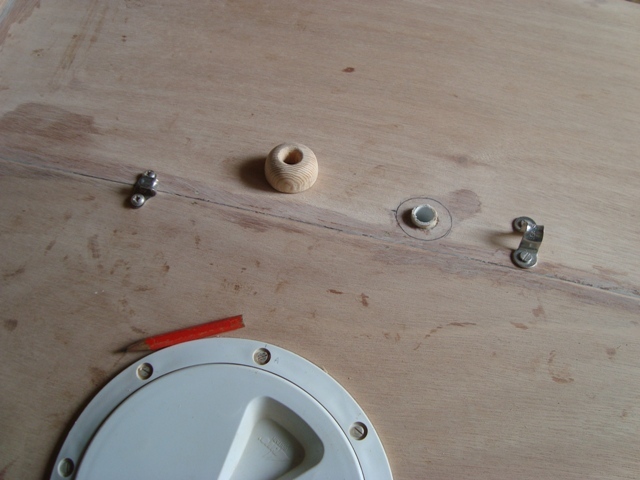 The nearest hole is offset for the lower main halyard block, so that the halyard will be clear of the kicker line from the upper hole. Spars varnished with first coat. I shall have to finish the coamings by sanding them. There may be a few minute gaps between the beading and the coamings. When I was clamping them with clothes pegs I didn’t see any, but if there are, they will need filling. When the coamings are finished I shall be able to start painting the hull. Between doing other things I squeezed in three short sessions on the boat in which I sanded both chine tapes and cut and test fitted the half-round strips of wood for the upper edges of the coamings. The latter have yet to be glued to the coamings. Today, 21st June, is called the longest day of the year, and yet all days are approximately 24 hours in length, each one of them with hours of darkness. By virtue of the fact that in my part of the world daylight lasted 16 hours and 40 minutes, I had the opportunity for fitting in the third session. Maybe tomorrow I’ll be able to epoxy the half-round strips of wood to the coamings. 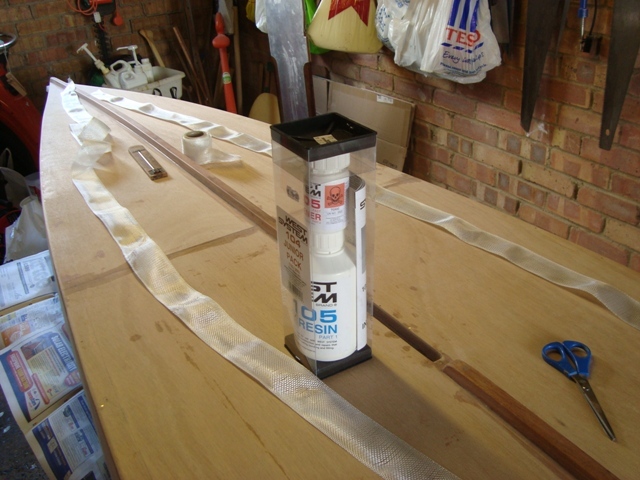 If the weather is kind, I may even be able to drill holes in the spars for attaching the sail, and give them their first coat of varnish. There was an opportunity this afternoon for repairing the starboard chine tape. While I was about it, I sanded both chines for a final coating of epoxy to fill in the weave. 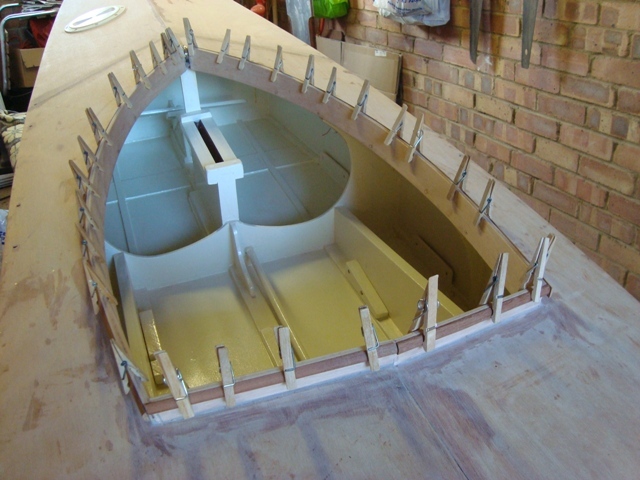 I also coated the interior of the keel box with epoxy. I’m a lot happier now that these things have been done. I’ll leave the epoxy to harden for two or three days before painting the exterior of the hull. From now on, my jobs consist mainly of painting and varnishing. Sorting out the sail and steering shouldn’t take a great deal of effort; then I’ll have to concentrate on preparing ‘Sharpy’s’ trailer to make it roadworthy. I’m still struggling to find a suitable name for the boat. There was a famous yacht named ‘Golden Vanity’ that took a very long time to cross the Atlantic while participating in the 1972 Observer Trans-Atlantic Race. In fact, I think she was placed last. I was puzzled by her name, because I could not associate the connection between ‘golden’ and ‘vanity’. There’s a great deal in the book of Ecclesiastes about ‘vanity’; indeed most of it revolves around the subject, i.e., as my Oxford English Dictionary defines the word – the quality of being worthless or futile. Ecclesiastes does not major on the other meaning of the word, i.e., excessive pride in or admiration of one’s own appearance or achievements. 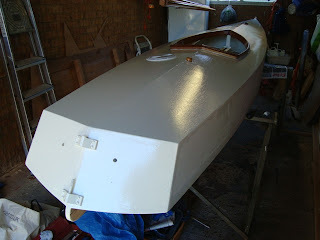 In a strict biblical sense, all activity not to do with glorifying God is vane, and from that point of view most of us spend practically all of our time doing vane things, which leads me to think I should name my boat ‘Vanity’, for she does little to glorify God or to bolster my self-esteem. I know of a boat with the name ‘Lowly Worm’, and that seems much more appropriate! However, I’d rather be original, and perhaps name my boat ‘Humble Bee’ or ‘Humble B’ – ‘B’ of course standing for Bill, but that would be too awful. You can see how difficult it is to find an appropriate name. There are thousands of them out there in Cyberspace, but not one strikes a chord. Further to my article of 12th June 2011, ‘Boats that I have Built’, here is another one to be added to the list. I built her in 1977 from a kit I purchased from Hunter Boats at Rochford, Essex. I was a member of the Up River Yacht Club when three of us approached Peter Poland and asked him to make a deal by giving us reduced prices. I think he took 10% off the normal basic kit price. Mine was a shallow draught boat with supporting bilge flanges to enable her to sit upright on a drying mooring. 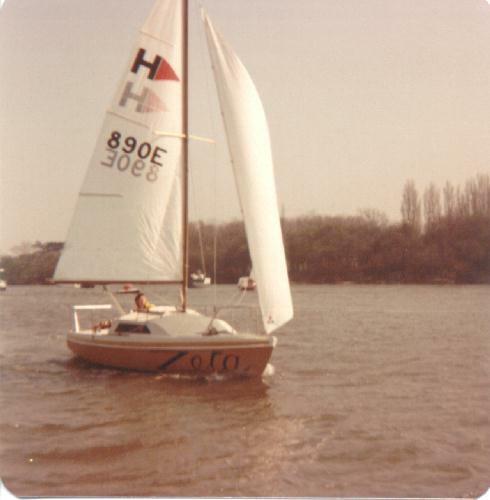 She proved to be very fast, and I did quite a few long trips in her: a return cruise from Hullbridge to Amsterdam and the inland waterways of Holland, lots of East Coast cruising and racing, plus two cruises in the English Channel, one of which saw me riding out a gale between the shipping lanes. To make the boat easier to handle for single-handing, I re-rigged her as a junk sloop. John Christian, who designed junk sails for the Newbridge range of yachts, designed the sail for my Hunter. I really appreciated the ease with which I could reef the boat, but she had excessive weather helm when running, because there was no way of moving the centre of effort closer to the centre of the boat. That proved to be her downfall, as it put a large strain on her rudder fittings. One memorable day when running before a strong wind from Brighton to Dover, a pintle gave way, so that I could no longer steer the boat. This happened not far from the Western Entrance of Dover Harbour, and as the wind was about a Force 7, I was in imminent danger of being swept onto the harbour wall. Fortunately, another yacht was entering the harbour and her crew realised something was wrong. They came to my assistance. At the third attempt they manage to get a line to ‘Zeta’ (Small ‘Zeta’) while one of the cross-channel ferries provided a lee. 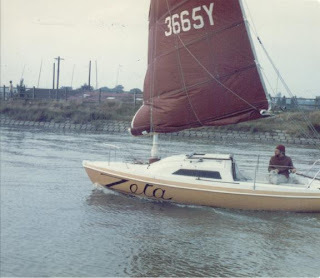 She was ignominiously towed backwards into the Harbour, and at one point, the skipper thought he had lost ‘Zeta’ when one strand of the three-stranded rope parted. He called for assistance from the lifeboat, but when he realised the rope was holding, he cancelled his request. Incidentally, towing a boat backwards is not as bad as it sounds, because she will yaw far less than when being towed from the bow. At the moment I can only cope with doing small jobs on the boat. This afternoon I found enough patience for applying the first layer of GRP tape to the chines. 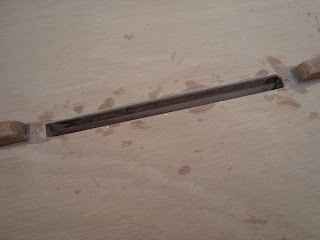 I made a hash of the starboard one, because the epoxy went off rather quicker than it should. Maybe I added too much hardener. Tapes in place. It's just as well that you can't see the starboard one! 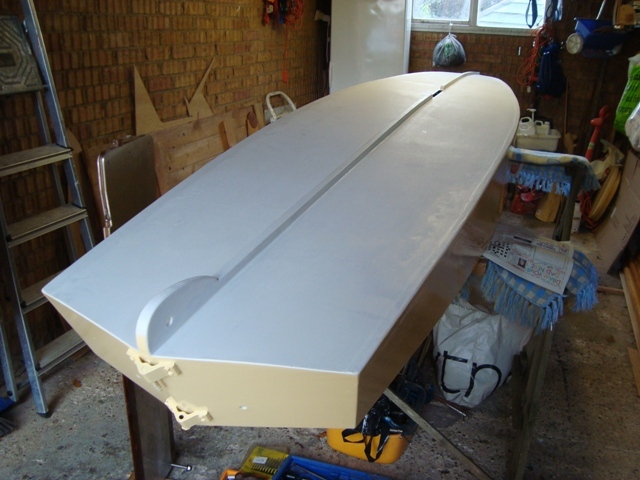 As I have done before with previous boats, I first applied two generous coats of epoxy to the plywood; then I stippled the tape with a stiff brush loaded with epoxy to make a cohesive bond between the two. However, I ran into difficulties because of the rapid setting of the epoxy. At my second attempt, this time on the port side, things went well. I made sure I had not put too much hardener with the epoxy, and instead of stippling with a brush, I went hands on, smoothing and stretching the tape with my fingers while wearing disposable gloves. That was the first time I’d done it directly with my fingers, and I was amazed with the excellent result – so much easier than stippling with a brush. I was so sickened with the starboard tape that I felt I couldn’t face doing any more on the boat today. I know that I shall have a hard job rectifying the appalling mess, but by the time I’ve finished, I’m confident it will look satisfactory. That will be an unwanted task I would rather not have to do. 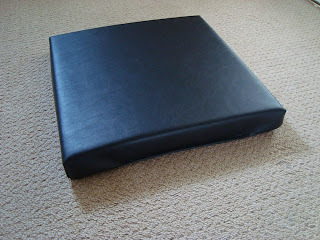 On a happier note, my wheelchair seat cushion, bought from Ebay, arrived this morning. I tried it out, and it felt quite comfortable. While I was buying the cushion, I should have ordered two, one for my bottom, and the other for my back. Well, I’ll give the cushion a trial when the boat is first launched; then I’ll make a decision about getting another for my back. 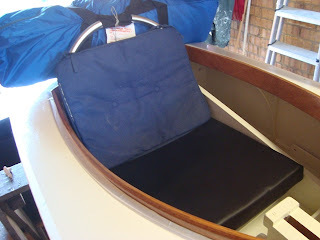 The advantage of a ‘stiff’ cushion is that I shall be able to lean it against the backrest when I’m boarding the boat. 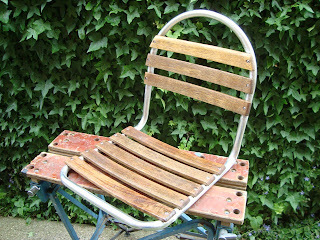 There it will not get wet, and when I have sponged off drips left by my feet, I shall be able to lay it down on the seat. Thus my shorts will be kept dry. Wet bottoms do not make for comfortable boating! 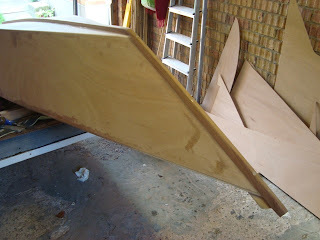 This series on Building ‘Sharpy’ does not entirely consist of descriptions of how I am building my keelboat; it also includes snippets that reveal how I feel. Sometimes I’m down, and on other occasions I am up. Today is definitely a downer! That shouldn’t be the case, because I’ve made the crucial decision to add GRP tape to her chines, and I’ve bought the materials, including more West System epoxy for doing it. At Homebase I also found a nice piece of half-round hardwood for the upper outside edges of her coamings. The hardwood will help secure a waterproof cover that will protect me when the going gets tough, just as a cycle cape keeps a rider dry when it rains. Because most of the handling of the boat will take place within the cockpit, there should be no need for me to get wet from spray or rain when sailing. Paddling with my single blade Canadian canoe style paddle will be a different matter, but I do have waterproof clothing I can wear, if required. 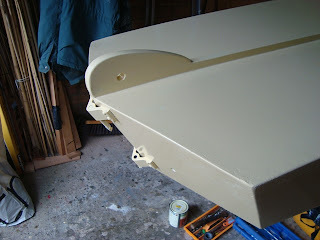 I had intended to paint the bottom of the boat today, but the wet weather put paid to that idea! Just as well, because I had time to think through the consequences of painting her hull without adding GRP tape to her chines. I have concluded that tape is a ‘must’ for the type of sailing I intend doing. Sailing her off a beach or a concrete slipway could bring about situations when her chines will come into contact with rough surfaces. 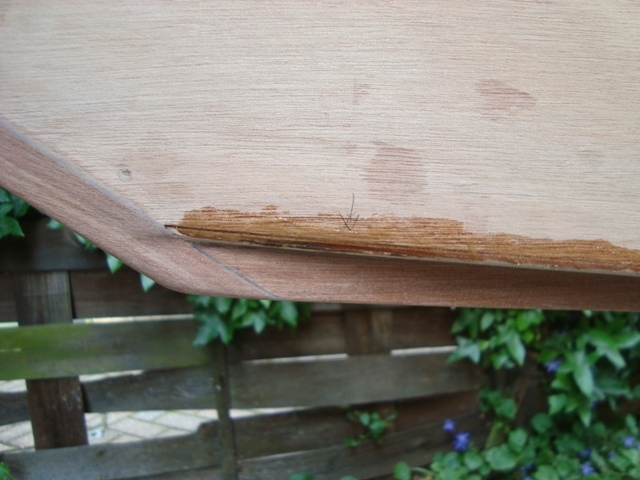 She does have internal chine stringers, but her bottom panels have their edges exposed, which means that abrasion could open them to water ingress, in turn causing the plywood to delaminate. 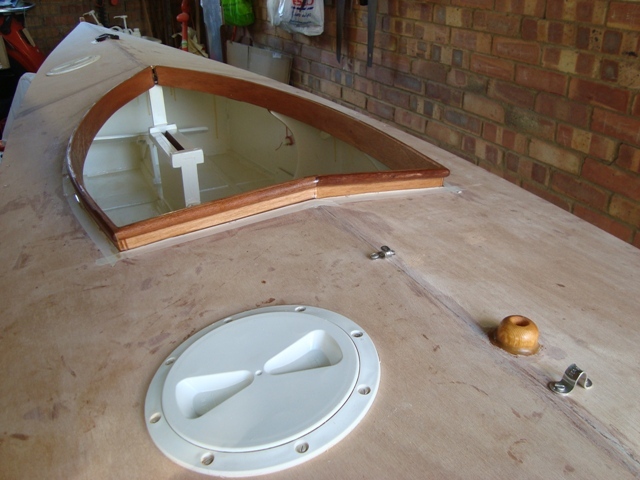 The reason for my deflated state is that I had hoped to make good progress towards finishing the boat; instead, I see quite a bit more work will be required. That always seems to be case. I arrive at a point where I think the next job will be ‘plain sailing’; then another obstacle or hurdle pops up! That’s life, but things could be much worse. In fact, nothing has been bad about today’s events, because they will lead to positive outcomes. 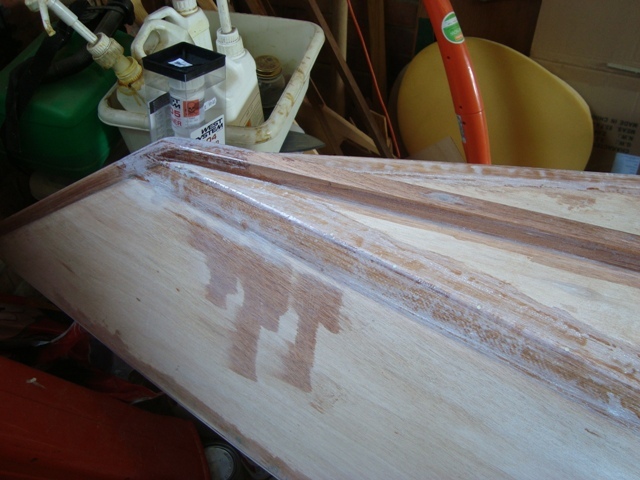 Today I was unable to spend a great deal of time on the boat, but I was able to sand the bottom, plus finish shaping the bottom edges of the keel box, and apply a fillet to the mainsheet collar. The temperature was a little low for working with epoxy; however, by having the blow heater near the spot, the temperature will be more than adequate to facilitate the chemical process of gelling and hardening. I’ll check it tonight, before going to bed. The interior of the keel box, where I have sanded it, will have to be coated with epoxy. I shall have to take care not to leave any dribbles of epoxy, because they could jam the keel. I made a fillet around the mainsheet collar to strengthen the bond which could be subjected to sudden loads when the sheet tightens, as during a gybe. There’s a temptation to delay finishing the boat because of satisfaction gained while building her. On the other hand, there’s a part of my mind encouraging me to finish her as quickly as I can for the prospect of sailing her. The knotty question of adding or not adding GRP tape to the chines remains. I wish I could make up my mind. Commonsense tells me to do it to protect the chines for when the boat will be in contact with a beach, but at the same time, I know that performance and appearance will not be as good if tape is epoxied to the chines. 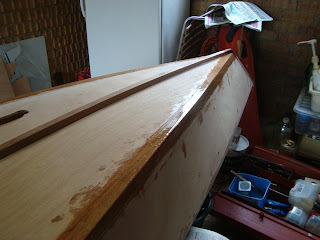 Many hours were devoted to sanding the hull and the spars. 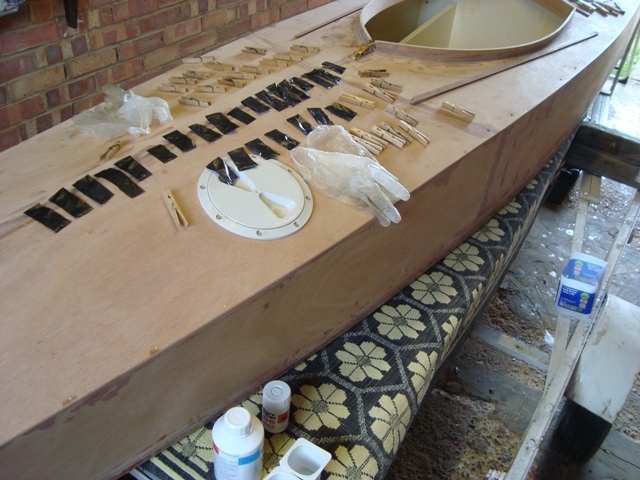 Apart from the bottom of the boat which needs a final sanding, I could start painting the hull and varnishing the spars, but I have not yet made the vital decision whether to add GRP tape to the chines. If I do, painting will be delayed. I made and epoxied the collar for the hole where the mainsheet enters the stern deck. I wonder how this will work in practice. If the mainsheet is pliable and fairly soft, I think it will be OK. Derek advised not having the boom pulley on a swivel, as shown in the design, because there is a tendency for the sheet to twist. 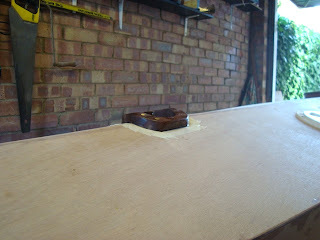 There are one or two little jobs that need attention, such as finding a place for the paddle. I’m considering Brian’s suggestion of having a bungee to keep the paddle on deck. This is an exciting stage of building the boat because I’ll be able to see the fruit of my labour. Painting the boat and setting her up with her sail and keel should be fun. 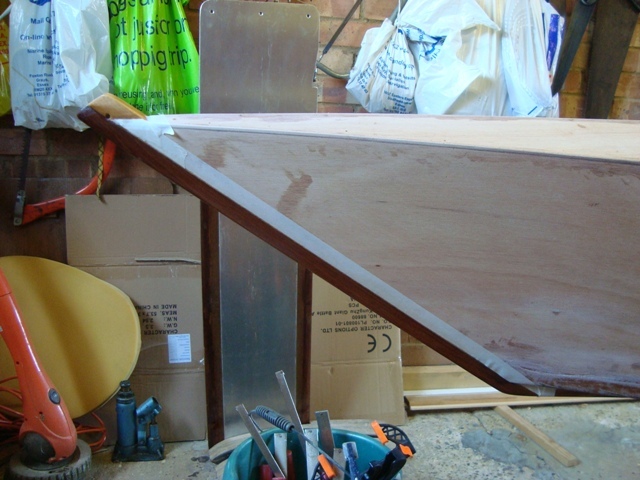 Afterwards I’ll need to focus my attention on the trailer, change the bearings and make suitable supports for the hull. I couldn’t spend a great deal of time on the boat today, but I was able to fill a few minute cavities along the seams where the bottom panels join the side panels. I mixed a small amount of epoxy putty and after moistening the crevasses with epoxy I filled and smoothed them with a wooden spatula. I had time to shorten the boom and yard to make them their correct lengths, and I also had time to drill a hole through the head of the stem post for a rope that will be attached to a toggle handle. If it proves to be strong enough, I’ll use the handle for lifting the bow of the boat when she is being conveyed on her trolley. 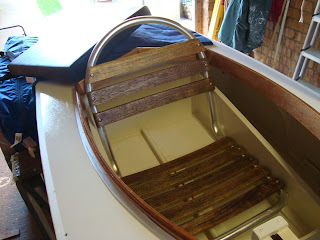 I have yet to make a trolley which will lock onto the skeg at the stern of the boat. This is not a priority, because ‘Sharpy’ will be transported on a lightweight road trailer that can be used as a launching buggy. 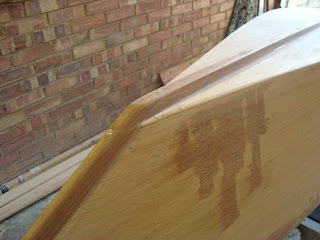 At the next opportunity I’ll tidy the epoxy fillings and finish the spars. 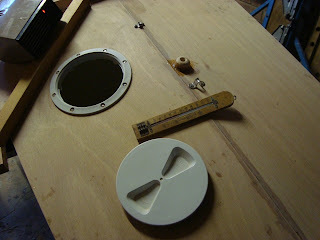 I’ll also make a tiny collar for the mainsheet where it enters the tube on the stern deck. If I decide against adding GRP tape to the chines, I shall be able to paint the exterior of the boat with the exception of the mainsheet collar until the epoxy hardens. It took quite a while to shape the outer stem post and round the chines. 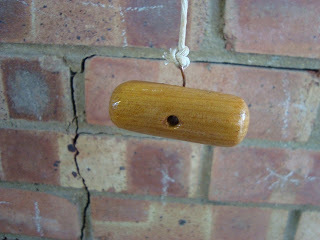 I have yet to finish the top of the stem and drill a hole through it for the rope of a toggle handle. Derek Munnion reckons it will not be necessary to add GRP tape to the chines. This leaves me in a quandary. Should I, or shouldn’t I? At the moment they are beautifully smooth so as to present little drag and be effective for creating lateral resistance and lift when the boat is on the wind. There are one or two very small voids between the bottom and side panels at the chines. 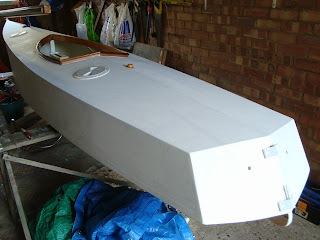 If I decide not to tape the chines, I’ll have to fill the voids before painting the hull. So far, I’m pleased with the finish and I’m cogitating adding half-round beading to the outer top edge of the coamings to form a lip which would help keep a spray apron in place. I’ll be exploring the possibility of adapting a cycle cape to act as a spray apron. A rubber bungee inside the lower hem would secure the apron to the coamings. 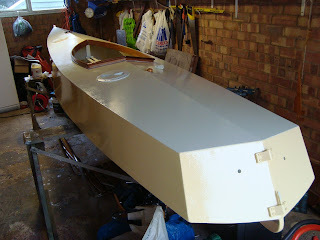 I built my very first boat at the age of 13. 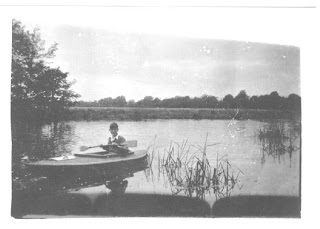 She was a skin on frame shortened Scout Kayak named ‘Tyrol’ after the Tyrolean Mountains. An elder brother had visited them and he told me how beautiful and majestic they were. My next homemade boat was a Percy Blandford PBK 15 decked canoe I built while doing National Service in North Wales. If she had a name, I cannot remember it. I sold her to a friend who used her for at least 20 years before she gave up the ghost. Unfortunately I do not have any photos of her. 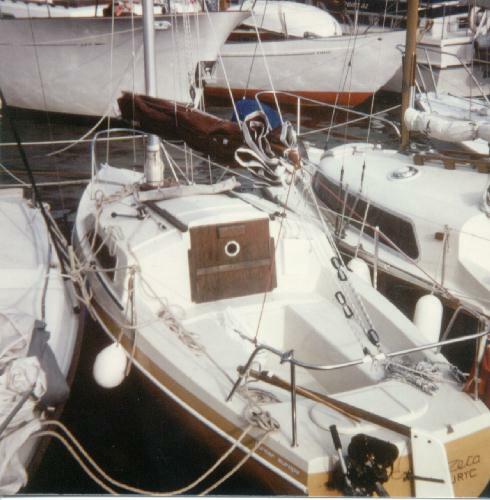 During intervening years I bought and renovated several yachts. 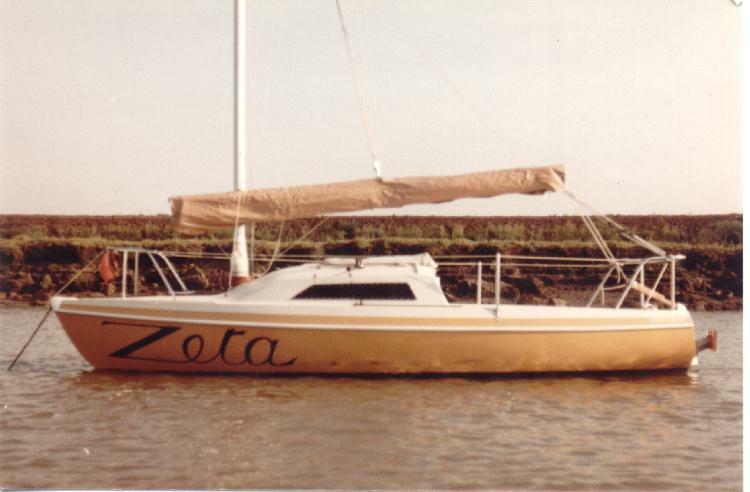 In the early 80s I built ‘Zeta’, a 25’ Folksong yacht from a hull and deck moulding. I gave her a junk rig with a tapered Needlespar mast. Next was ‘Micro’. 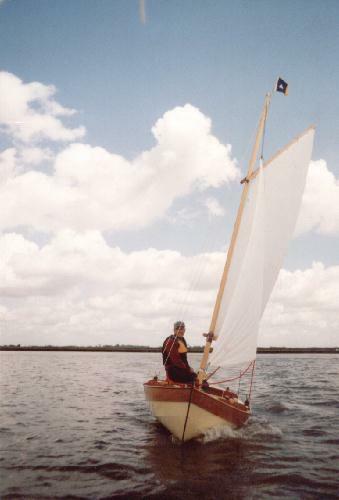 She was based on Swallow Boats’ Storm Petrel. I bought just the hull panels and modified the design for weekending. I equipped the boat with bilge keels instead of a daggerboard, which gave me room for a full length berth under a boom tent. 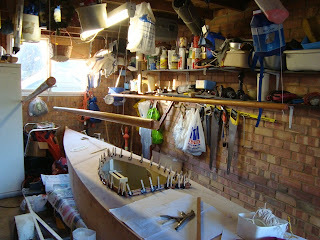 After ‘Micro’ I built ‘Caleb’, a 50/50 sailing and paddling decked canoe designed specifically for me by Paul Fisher. The boat that I consider to have been my best in terms of craftsmanship was ‘Faith’, a Paradox sailboat designed by the genius Matt Layden. I doubt I shall give her this name, but she is the boat I am now building and hope to finish in time for sailing this season. Her designer is Derek Munnion, and she is very unusual in that she has a proper drop keel, which should make sailing her a leisurely affair.